Homepage. This page: White Electron Minor photograph. I found this tiny home-built parked in a domestic driveway many years ago. It was surrounded by lumps of old Triumph Herald - whether it went on to survive or not I don't know. Fairthorpe Books Whether for the Electron Minor as shown below, or any other type of Fairthorpe, it is worth having a look on Amazon for books, DVDs, Videos etc. Have you seen today's eBay auction listings for the Fairthorpe Electron Minor? Photos of Fairthorpes and other collector's vehicles. 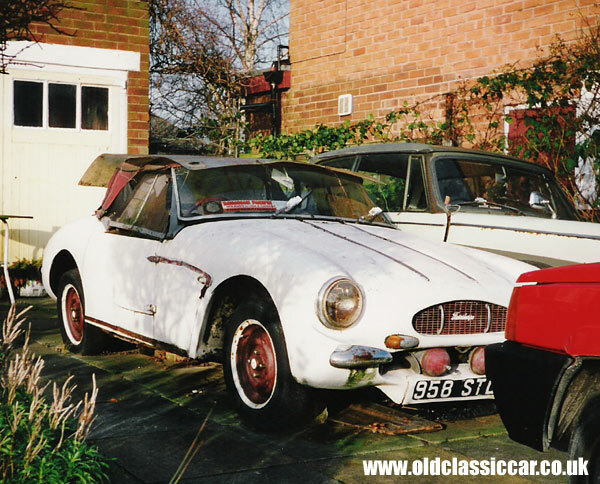 The photo on this page of the classic Electron Minor from Fairthorpe is one of several thousand images to be found across oldclassiccar. This picture is one of 105 that feature in this particular set, which contains miscellaneous images taken at a variety of events since 1990. Some of them were scanned from traditional print photographs and as such aren't the same quality as those that were taken on my digital camera. Unless stated otherwise, the photos in this miscellaneous set were taken by myself - thumbnails of the other 104 can be found on the Antique vehicle photographs page. To see a list of all the image collections, and maybe find more examples of Electron Minors, please visit the main car & other vehicles photo page.